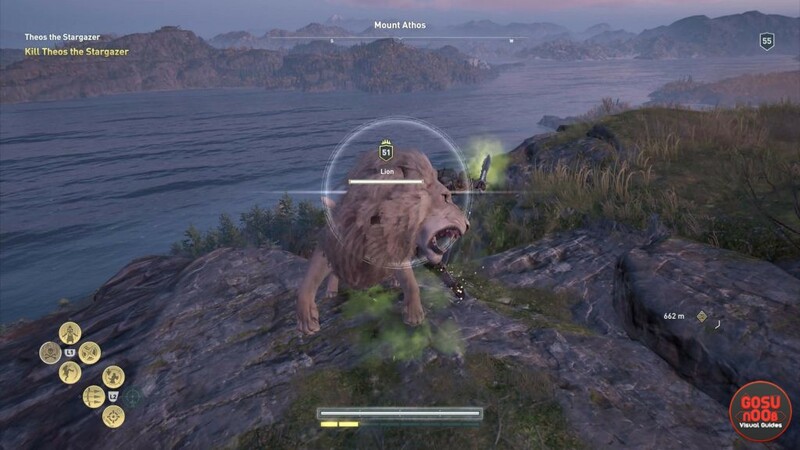 The Makedonian Lion in Legacy of the First Blade AC Odyssey DLC is an animal that you can hunt down. It’s been added with the new DLC, and you have to kill the Makedonian Lion to get the Lone Lion achievement / trophy. It’s a fairly minor deal, but definitely important if you want to 100% the whole thing or whatever. Our AC Odyssey Makedonian Lion Location – Lone Lion Achievement / Trophy is going to show you where to find the Macedonian Lion to get the achievement. Where to Find Makedonian Lion Location in AC Odyssey Legacy of the First Blade DLC? To find the Makedonian Lion in the Legacy of the First Blade DLC, you have to go to the easternmost finger of the Chalkidike Peninsula – Athos. In fact, the lion is at the top of Mount Athos, the tallest peak in the region. Basically, all you have to do is follow your eyes to find the mountain in the center of Athos, and clamber your way to the top. That’s where the lion will be waiting for you. There’s even a fast travel / synchronization point nearby for you to find. if you’ve been through this area with this character before, you’ll have an even easier time finding the Makedonian Lion. All you have to do is fast travel to the Mount Athos synchronization point. When you pop up there, just turn around, and you’ll spot the lion a little ways away. All that’s left is to kill the animal, and you’ll get the Lone Lion achievement / trophy. When it comes to the fight itself, there’s not much to talk about. The lion is not a tough enemy at all; you’ll down him fairly quickly, I’m sure. That’ll about do it for our Makedonian Lion location guide. In case you need further help, please browse through our other guides. Among others, we’ve got Aiantides Treasure Location – Thank You Malaka Quest, Accuse Magistrate or Doctor – Mysterious Malady Quest, and Blacksmith Code – What to Answer.